The James Byrne estate designed by Grosvenor Atterbury c. 1906 in Oyster Bay. Byrne, an attorney, had been partner in the law firms of Carter, Hornblower & Byrne and Byrne, Cutcheon & Taylor. He established the Byrne Professorship of Administrative Law at Harvard University. The estate was sold to William R. Coe in 1913 but the house suffered a fire in 1918 and was ultimately demolished. Coe hired Walker & Gillette to build a replacement which can be seen HERE but some of the original outbuildings remain. 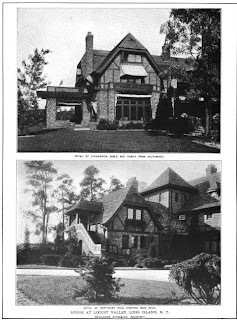 Click HERE for more on the James Byrne estate. Click HERE to see Coe's 'Planting Fields' on google earth and HERE on bing. 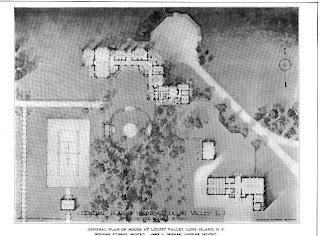 You can see from the site plan that the Guy Lowell designed Italian Blue Pool Garden (featured 2 weeks ago) was built on the site of the Byrne's tennis court. 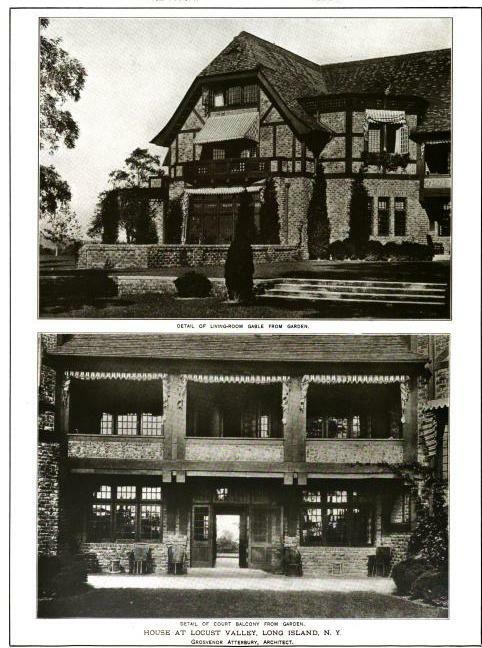 What a great looking building and obviously the Coes loved a lot about their former home since they practically rebuilt the same Atterbury outline and retained alot from the floor plans in their new home. I also think the rebuilt Coe Hall is a great looking home and todays property shares the best features of the former estate with the enhanced gardens, greenhouses and gates of the later construction. Wonderful pictures---Brickbuilder covered houses well. 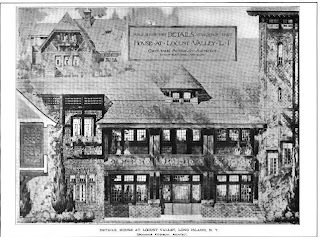 Imaginatively patterned designs. 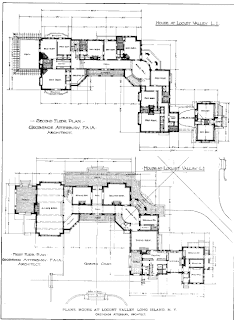 One suspects that the pre-existing foundation, as much as affection for the old house, played into the planning of the new house. The remains of the Byrne's Bar Harbor house, by Guy Lowell, can be seen here (unfortunately, I had no vintage shots of the house in its elegant pre-Catholic seminary days. All I thought that remained of the original out-buildings were the brick seating area behind the house and possilby the tea-house. I've rarely considered seating areas to be outbuildings...but what I meant was that the stables, hay barn, carriage house and super's residence were all designed before the fire (by W&G) in a style to match the original residence. I was curious about the cause of another house-destroying fire and did a NY Times search and came up with quite a dramatic story. Seems the house was being fixed up for the Coes' return -- full of workmen, the servants had arrived two days previously to ready the house. Thanks Patricia for the link. 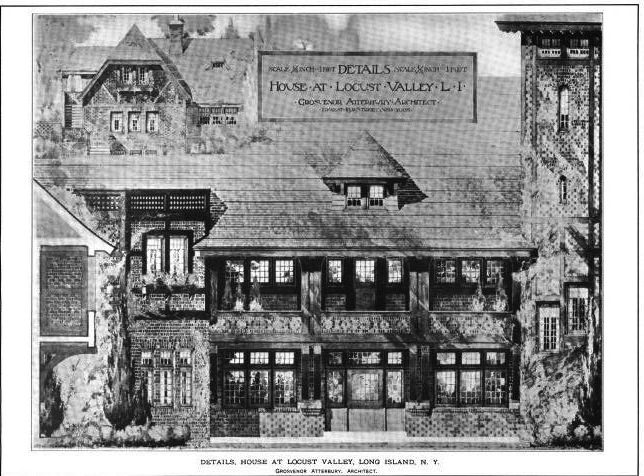 It was such a fire with the loss of art work that led Otto Kahn to design a "fireproof" house on Long Island after his New Jersey mansion went up in flames. He supposedly was devestated that under his watch great works of art were forever lost. 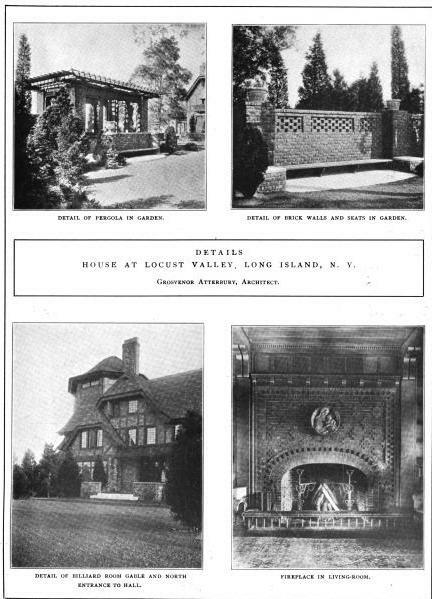 His fireproof home Oheka did indeed work and survived numerous attempts at arson prior to its renovation. 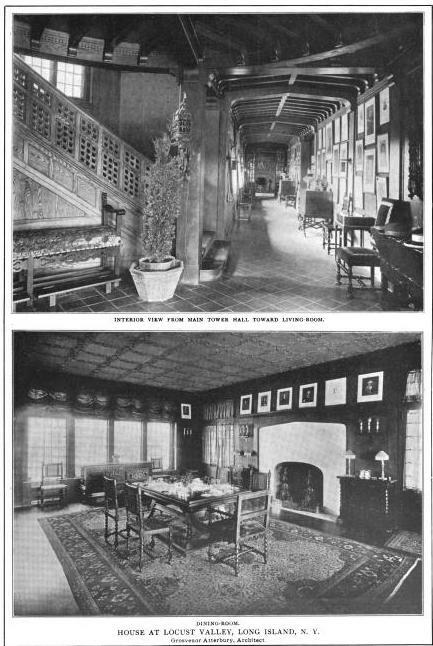 I worded that incorrectly, I meant I thought that the seating area and tea-house were the only survivors of Grosvenor Atterbury's work, I also would not consider a seating area an out-building. I have always thought that the Atterbury design to be far superior to its unimaginative replacement. 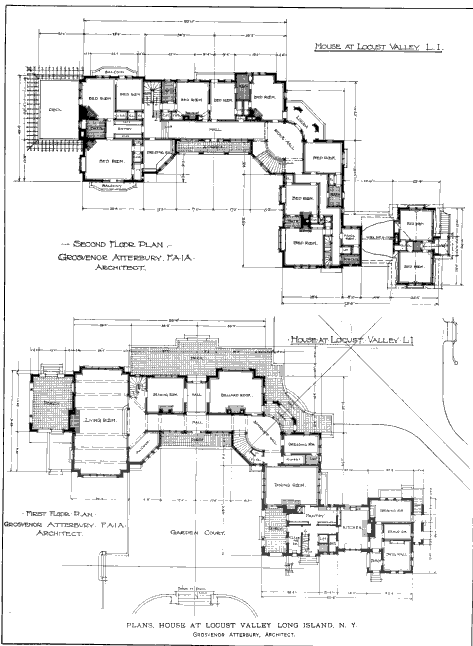 Atterbury's design was imaginative, appropriate to the site, and quintessentially American. The house that replaced it looks more like a standard-issue Presbyterian Seminary somewhere in the Midwest. 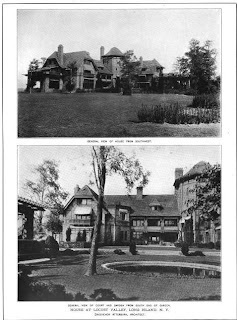 Does anyone know how to get in touch with either descendants of Mrs. James Byrne or the current owners of this estate? We are cleaning out house and just located something they may find of interest .